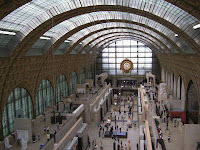 I enjoyed my favourite French museum, the Musée d'Orsay (Orsay Museum, France), in Paris on 13 April 2007 in company of François and Valentine, whom I had not met for a long time. A former train station, the building is spacious, beautiful and bright. The art works are mainly masterpieces that tell us stories both individually and in connexion with their surroundings. As always, my admiration goes to the architects and artists, and my congratulations and best wishes to the staff.